The urgent need to implement the sustainable development goals (SDGs) has led to their prioritization and to the mobilization of institutional actors and civil society at the global level. However, it is at the local level that the consequences are particularly felt. Achieving SDG 4 on quality education thus requires both global and local commitments to developing optimal educational strategies. In recent decades, and in many countries, the education sector has undergone decentralization policies that have involved the transfer of responsibilities to local stakeholders, be they educational experts or elected bodies. Since 2002, the International Institute for Educational Planning of UNESCO (IIEP) has pursued an intensive research programme on decentralization issues and their impact on the formulation and implementation of educational policies. 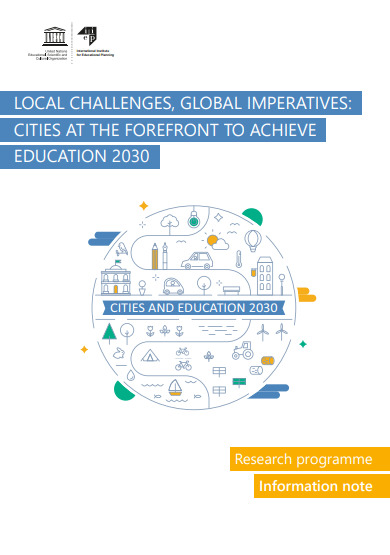 With this in mind, and in response to the growing challenges to be tackled by local governance in order to achieve SDG 4, IIEP is launching its new research programme, ‘Local challenges, global imperatives: Cities at the forefront to achieve the Education Agenda 2030’, to examine the growing role of cities in educational planning and management. In order to cultivate strategic reflection on the achievement of SDG 4, this research should make it possible to identify the major challenges facing educational planning by elected local authorities, and to stimulate the sharing of experiences and strategies between cities and countries. To this end, IIEP's research will be carried out in countries and cities around the world. Research will be based on field surveys, the first of which will begin in France in 2019 and the rest of which will be conducted in cities across the globe starting in 2020. At the same time, a statistical survey will be carried out in several dozen cities worldwide, in varying geographical contexts with differing resources. Responsibilities and profiles of local elected authorities in charge of educational planning. Characteristics of the educational planning and management cycle at the city level. Management of available resources by the city. Collaboration between local education professionals and other actors in society and the private sector. Co-ordination mechanisms with other sectors. Relations with the relevant ministry of education at the central level.